SSL/TLS allowed efﬁcient ﬁxes in order to counter the issues. 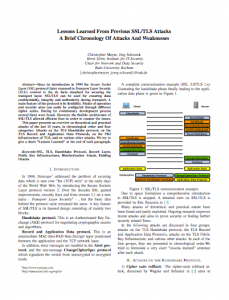 This paper presents an overview on theoretical and practical attacks of the last 15 years, in chronological order and four categories: Attacks on the TLS Handshake protocol, on the TLS Record and Application Data Protocols, on the PKI infrastructure of TLS, and on various other attacks. We try to give a short ”Lessons Learned” at the end of each paragraph.